Sometimes deprivation results in pleasant inventions. Incessant rains deprived me from my weekend grocery shopping this week. Tired of waiting for the rains to stop I finally decided to take matters into my own hands and bake my own batch of bread. But then the lowering of temperature led to a wholewheat dough that was rising at its own sweet yawning pace. So bread was out. A few drops of olive oil to the dough and pizza was in. But oh wait, there was no cheese. Oh well, we’ll see about that. Knead everything together for 10 to 15 mins till dough becomes elastic. Cover with damp cloth and let it rise till almost double in volume. 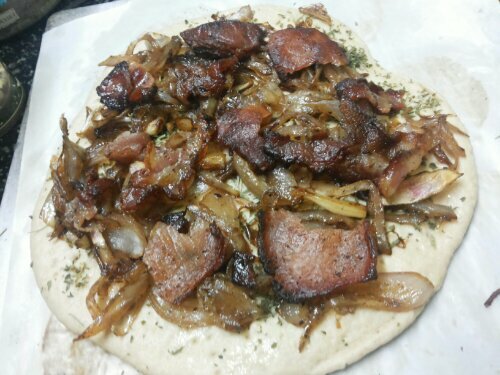 Punch it back, roll it into a round pizza base. Transfer it on to a parchment lined baking tray, prick the surface with a fork and cover for 10 mins. Add thinly sliced onions to bacon fat and caramelise over low flame with butter and seasoning. 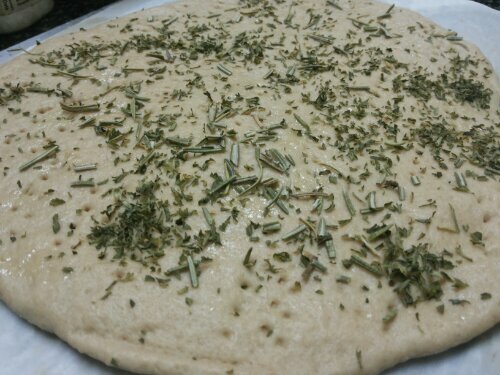 Sprinkle rosemary and parsley on pizza dough. Bake at 180 deg C for 20 mins. For a crisper base, turn up the heat to 220 deg C and bake an additional 5 mins.